Are you looking for resilient and versatile flooring to complement your home’s décor? Then you’ve come to the right place. Like other flooring stores, we offer many different types of products, but unlike our competitors, we back up the quality of our products and services with unbeatable warranties and guarantees. When you’re in search of quality laminate flooring, there’s nowhere else you need to go. Our vast inventory allows you to find exactly what you need, and our experienced professionals can help you in your renovation journey. With different colors, styles, and textures to choose from, you have nearly unlimited laminate flooring options. If the choices seem overwhelming, let us help you narrow down the selection to the few that truly match your needs. Whether you want rich, warm tones in your living room or a modern motif in your bathroom, you can count on us for all your laminate needs. In addition to offering high-quality products, we also provide our customers with the resources they need to quickly complete their projects. Our laminate flooring installation team has worked with this material for years and knows the proper tools and techniques to use to ensure the optimal beauty and longevity of your new floors. Choosing stunning floors that fit your aesthetic preferences begins with the selection process. Here’s where our sales staff and designers are able to help. We are happy to answer any questions you might have about the differences between brands and materials. In addition, we can use computer technology to help you envision what the finished result will look like so you can feel completely confident about your purchase decision. Once you have chosen the perfect laminate floors for your home, work with our installers to ensure the process is carried out correctly. You don’t have to waste valuable time trying to look for a qualified contractor because we have several on-site waiting to help you. With years of training and experience, our professionals know how to cut out the inefficiencies of the installation process while still producing remarkable results. We work diligently and with a keen eye for detail so you can enjoy your new floors as soon as possible. Today’s laminate floors are stylish, durable, and well worthy of a place in anyone’s home. 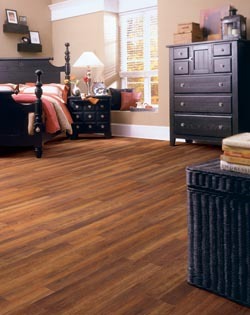 Advances in manufacturing technology have made laminate flooring more durable and attractive as ever. Laminate floors are made up of four different wear layers which work to protect it from damage due to heavy foot traffic and other daily wear. However, these layers also create a non-permeable surface, which means water and liquids will sit on top of the surface instead of sinking in. This not only makes it resistant to stains, but also ensures you won’t have mold or mildew growing in the crevices. While having a range of laminate flooring options is wonderful, it doesn’t mean anything unless one of those options is truly satisfying. That’s why we guarantee that if, for any reason, you don’t absolutely love your new floors within the first 30 days of purchase, we’ll install new floors free of charge. This is just one way we like to express our dedication to our customers. Contact us to learn more about our durable, versatile laminate flooring. We proudly serve customers in and around Springdale, Fayetteville, Lowell, Cave Spring, and Siloam Springs, Arkansas.